When I plug my iPhone into iTunes to sync and I want to import an album that has a video in it from iPhoto, the videos won’t be on my phone and all the photos aren’t appearing either. iPhone 5s with a new MacBook Pro mid 2014.
iPhone allows users to add and watch videos, including movies and television shows from their own collections, on the phone’s display. Therefore many iPhone users like to transfer videos to iPhone from PC/Mac or other devices for enjoyment. For Mac users, iTunes is always regarded as the first choice if users want to transfer video from Mac to iPhone. Actually, excepting for iTunes, there are other better choices for syncing videos to iPhone from Mac computers. The following post will introduce some ways for you. If users want to transfer video from Mac to iPhone without the sync of iTunes, the third party iPhone transfer for Mac can be helpful for this issue. Users are able to find various kinds of data transfer programs for iOS devices on the Internet. 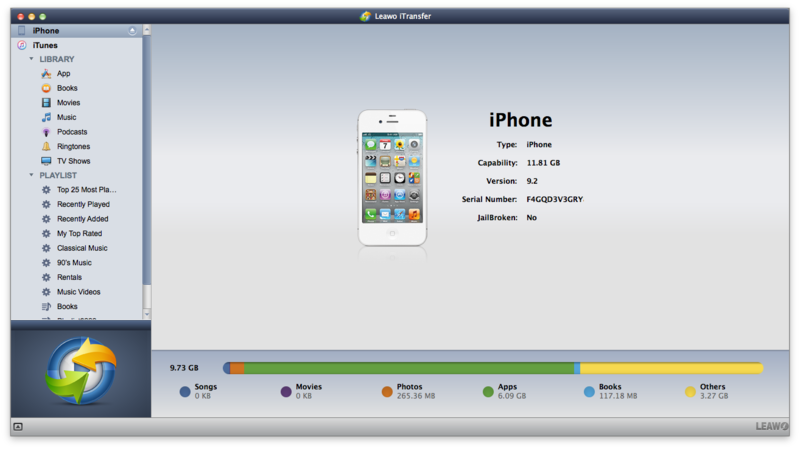 Leawo iTransfer for Mac have a great performance among these data transfer programs. This program enables user to transfer files among iOS devices, iTunes and Mac computers without the sync of iTunes, and it makes the data transfer easy to be done. The following guidance will show you how to transfer videos from Mac to iPhone, and users are allowed to free download Leawo iTransfer for Mac to have a try. Note that the trial version has limited transfer times. Tips: Leawo iTransfer only works with iTunes installed on your Mac. 1. Run Leawo iTransfer for Mac and connect iPhone to computer with the USB cable. The program will automatically detect the libraries of the iPhone, and list the libraries in the left sidebar. 2. Choose “Movies” Library and you will see the contents in the right part of the window. If your Movie Library is empty, you will see an “Add File” button in the window, which allows you to click to add videos from computer. If you have videos in your iPhone, you need to click “File > Add > Add File/Add Folder” at the upper right corner to add videos from the Mac computer. 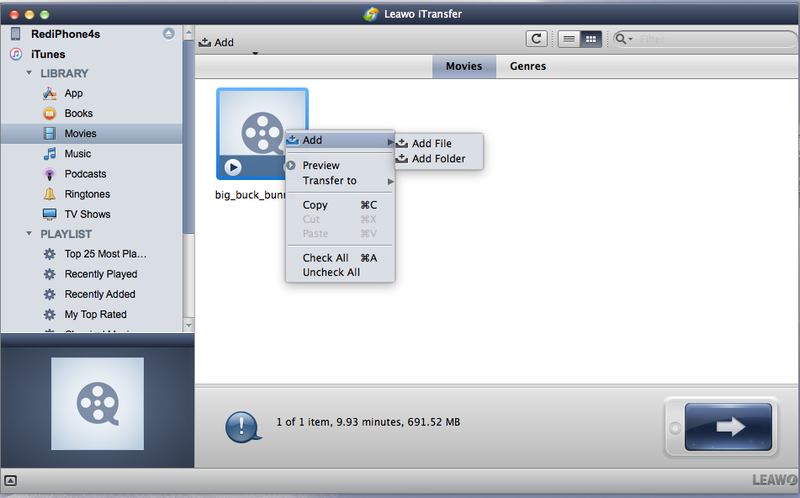 After adding files from computer, Leawo iTransfer for Mac will begin to transfer video from Mac to iPhone. The progress bar in the pop-up dialog will show the percentage of the transfer process. When the video transfer is finished, you will get the videos in your iPhone. Leawo iTransfer is helpful for all kinds of data transfers of iOS devices, and it also helps to backup iPhone, iPad and iPod files to computer. For example, you are able to backup iPad files to computer with this program. If you are interested in Leawo iTransfer, just free download it and have a try. And users still have other methods to sync videos to iPhone. For example, the third-party cloud service apps will be helpful for the data transfers of iPhone, iPad and iPod. Dropbox is a good cloud service app which helps for the data transfers of iOS devices. Users need to install the app on Mac and iPhone, then register the program with an account. After that, users are able to put the videos in the Dropbox folder on their computer, and the videos can be seen on iPhone within short time. The following guidance will show you how to transfer videos to iPhone from Mac computers. 1. Install the app on Mac and iPhone, then register the program with an account. Click the “Upload” button from the very top of the window. Then upload the videos in the Dropbox folder on Mac. 2. Click “Data Settings” on iPhone, select “Dropbox” option. A pop-up window opens up. You will see a “Public” icon on menu bar. The “Public” folder contains all your stored photos & videos. 3. Select videos which you wish to download from “Public” folder. You will see a star icon located at the upper right corner of the window. Click it. 4. Click “Download” button located at upper right corner of the window. Then click “Save to Photo Library” option. The video will be stored in your iPhone’s gallery. When users want transfer video from Mac to iPhone for an enjoyment, iTunes can be a very helpful program. Users only need to add the videos into iTunes library and then they can sync their iPhone with iTunes to add the videos into their iPhone. 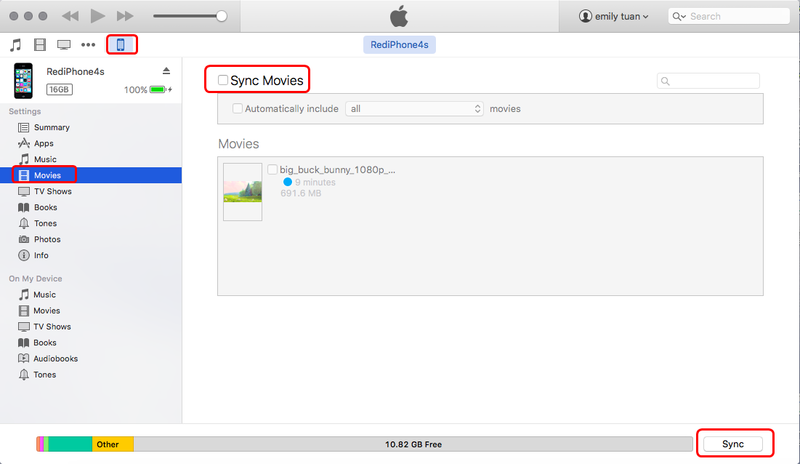 The following steps will show you how to sync videos to iPhone on Mac. 1. Launch iTunes and click iTunes “File” menu. Click “Add to Library” option to choose the videos that you want to transfer from Mac to iPhone and add them to iTunes Library. Click the “Movies” tab on the right sidebar of iTunes Windows. And check the option “Sync Movies”. Then you can see the videos you have added to iTunes Library. Check the videos you want to transfer and click “Apply” button to transfer video from Mac to iPhone. If the users come up with the problems as the user posted, they will find that iTunes is not useful at the moment. Maybe the users can have a check at the storage space on their iPhone by tapping Settings > General > Storage to see whether they have enough space to sync the videos. If the storage space is limited on the iPhone, users won’t be able to add more data into the device. If the storage space is not the problem, iPhone users can turn off the auto-sync on iTunes and have another try. Sometimes the auto-sync will get stuck and the transfer may not accomplish. To turn off auto-sync in iTunes, users only need to go to Edit > Preference > Devices, and check “Prevent iPods, iPhones and iPads from syncing automatically”. When the users start iTunes next time, they will be able to manually sync files between iTunes and iPhone. Of course, the third-party apps on Mac computer, such as iPhoto mentioned in the OP, may also lead to the failure of the transfer. When the users transfer files from iPhoto to iTunes, iTunes might not recognize the files therefore the sync with iPhone will also fail. All in all, various kinds of reasons will lead to the failure when users want to transfer video from Mac to iPhone.